On April 27th 2003, the sixty-first anniversary of the last bombing raid on Bath, a ceremony was held to unveil and dedicate a memorial to those residents and visitors in Bath who died as a result of the air raids. This is a photograph of the Memorial. 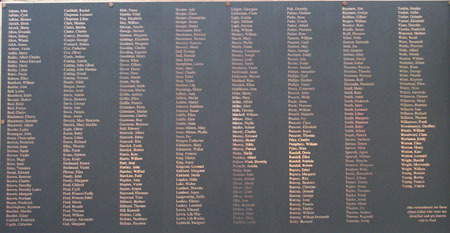 The lower plaque lists the names. On 26th May 2006, Project Committee member Michael Stockley passed away. Michael arranged the manufacture and installation of the memorial, and thus it remains as a fitting tribute to his valuable contribution to the Project. The memorial has been mounted on the War Memorial at the Royal Avenue entrance to Victoria Park. Those unfamiliar with that area of Bath can click here for a map (which appears in the second window). The project is very grateful to the Royal British Legion for permission to mount the memorial there. The Project has chosen to use the same materials and type face in the construction of the memorial to the civilian casualties, as was used for the plaques on the War Memorial that commemorate the members of the Armed Services who died in the Second World War. To read how the Bath Chronicle reported the unveiling, click here. Each year since the unveiling, the Project has arranged a memorial service. The Services button at the top leads to descriptions and pictures of these events.